NASHVILLE, Ind. (AP) — State wildlife officials are investigating a southern Indiana family's report that a mountain lion killed their pet cat. SALT LAKE CITY (AP) — Students and teachers were forced to stay inside a suburban Salt Lake City school while wildlife officials corralled a mountain lion that was spotted nearby. SALT LAKE CITY (AP) — Two Salt Lake City area elementary schools are keeping students inside after reports of a mountain lion sighting in a backyard near one of the schools. Jordan School District spokeswoman Sandra Riesgraf said Friday that the cougar was spotted by a resident early Friday morning in backyards of houses near Foothills Elementary School in Riverton, about 25 miles (40 kilometers) southwest of Salt Lake City. NAPA, Calif. (AP) — A fatally shot young mountain lion in Northern California that was part of a research project has set off angry criticism and left a family defending its actions. BILLINGS, Mont. (AP) — State wildlife officials say hunters in several western Montana hunting districts have met the quota of female mountain lions for the season. The Montana Fish, Wildlife and Parks department says hunting in portions of Mineral, Sanders and Missoula counties closed Sunday evening. Hunting in portions of Mineral and Missoula counties will close Monday after sunset. BEND, Ore. (AP) — Authorities say they've killed a cougar that had been seen around homes in Bend. BISMARCK, N.D. (AP) — North Dakota's Game and Fish Department has confirmed that a mountain lion passed through the city of Lincoln about a month after a lion wandered into the middle of nearby Bismarck and was killed by police in the interest of public safety. Two lion confirmations in such a short period is probably a first for the capital city area, but they are likely an anomaly and no cause for public concern, according to the state's lion expert. MACKAY, Idaho (AP) — Idaho wildlife officials say a woman who thought she was breaking up a dog fight quickly realized she'd grabbed hold of a young mountain lion. TOPEKA, Kan. (AP) — State game wardens have confirmed a mountain lion carcass was found in north-central Kansas. The Kansas Department of Wildlife, Parks and Tourism reported Thursday that hunters found the female lion's remains in Rooks County, just north of Hays. The agency said the group of hunters contacted a local game warden. The incident is still under investigation. KETCHUM, Idaho (AP) — Mountain lions have killed two dogs this month near houses in the Wood River Valley, Idaho wildlife officials said. BISMARCK, N.D. (AP) — Late-season mountain lion hunting has been closed in western North Dakota's Zone 1, after the limit of seven animals killed was reached. However, the state Game and Fish Department says a conditional season in Zone 1 will open Jan. 28 for hunters to pursue six lions that weren't taken during the early season. The early season harvest limit was eight cats, and only two were killed. FLORENCE, Mont. (AP) — Mountain lions have been sighted near a school bus stop used by a rural Montana school district. The Ravalli Republic reports that Florence-Carlton School District said officials received a report of three mountain lions near the area where the bus turns around west of Florence on Tuesday morning. BISMARCK, N.D. (AP) — A mountain lion that wildlife officials had tracked last fall before it thwarted their efforts was shot and killed Tuesday after wandering into an area not far from the North Dakota state capital city's downtown. APOLLO, Pa. (AP) — Making a prize trophy — be it a deer, bear, turkey, mountain lion, zebra or any other mammal, fish or fowl — look lifelike through taxidermy for hunter or fisherman is a real art form, area taxidermists say. "I like to create art, and that is what this really is," said Randy Kanner, owner of Fur, Feathers & Fins Taxidermy of Washington Township, Westmoreland County. LOS ANGELES (AP) — Officials say a mountain lion that survived Southern California's recent wildfire was later found dead with badly burned paws. The National Park Service said Friday that a GPS collar worn by the big cat known as P-64 transmitted signals on Nov. 26 and Nov. 28 — more than two weeks after the destructive Woolsey fire broke out. HOLDERNESS, N.H. (AP) — Two of the known mountain lions in New Hampshire have spent their 15 years in close proximity to humans. But you won't find evidence of their existence in paw prints in the snow or a deer carcass in a tree. The brother and sister big cats have lived their lives behind a thick pane of glass at the Squam Lakes Natural Science Center in Holderness. They came to the center after their mother was killed in Montana. WALSENBURG, Colo. (AP) — Wildlife officials who seized a mountain lion kitten from a southern Colorado home say the feline fell ill after the residents fed it bratwurst. GORDON, Neb. (AP) — Authorities say a police officer fatally shot a mountain lion found inside the city of Gordon in the northern Nebraska Panhandle. Sheridan County Attorney Jamian Simmons said Tuesday that a resident trapped the mountain lion in a side yard Monday evening between his car and a fenced area. The Gordon officer shot it soon after arriving at the home. KALISPELL, Mont. (AP) — Erik Wenum is known as the "bear guy," and it's an apt moniker, given the fact that he's handled nearly 5,000 bears during his tenure with Montana Fish, Wildlife and Parks. PLEASANTON, Calif. (AP) — A mountain lion roaming the parking lot of a busy office complex in the eastern San Francisco Bay suburbs has been tranquilized and removed with some high-tech help. Police in Pleasanton, California, and California Department of Fish and Wildlife officers used a drone with thermal imaging cameras to track the puma, which appears to be about a year old and healthy at about 80 pounds. It took four tranquilizer darts to bring him down. BOX ELDER, S.D. (AP) — Police in Box Elder have shot and killed a mountain lion that was spotted roaming near schools last week. Officers spotted the animal in Veterans Park Friday evening. One officer shot and wounded the lion when it was up in a tree. The wounded animal fell to the ground, and another officer — fearing the big cat could head to nearby homes — shot it again. IRONWOOD, Mich. (AP) — State wildlife officials say a cougar has been spotted in Michigan's far western Upper Peninsula. The animal was photographed about 9 miles north of Ironwood by a game camera set up by the Department of Natural Resources to record deer movement. The camera captured three daylight images of the mountain lion. It wore no tracking collar. Biologists couldn't tell whether it was a male or female. DEADWOOD, S.D. (AP) — State wildlife officials shot and killed a young mountain lion in the Deadwood area for safety reasons. The Black Hills Pioneer reports the lion was killed Tuesday, a day after being spotted near Deadwood's Welcome Center carrying a dead deer down a walking path. Big cats in Pennsylvania: mountain lions or bobcats? PHILADELPHIA (AP) — An instinct coiled way down in the human brain knows the difference between a bobcat and a mountain lion. A bobcat gives you a warm, that-kind-of-looks-like-my-cat-but-slightly-bigger feeling. THOUSAND OAKS, Calif. (AP) — A litter of blue-eyed mountain lion kittens has been discovered in Southern California's Santa Monica Mountains, but researchers believe they are the product of inbreeding, a serious problem for the population isolated by a major freeway. CODY, Wyo. (AP) — Wildlife officials have euthanized a mountain lion suspected of killing a deer fawn and a house cat in northern Wyoming. Luke Ellsbury, a biologist with Wyoming Game and Fish, says the department received word of a dead deer cached in the backyard of a home in Cody on Monday. The partially eaten house cat was found nearby. Wildlife officials captured a young female mountain lion at the home and decided to put it down because it was sick and emaciated. 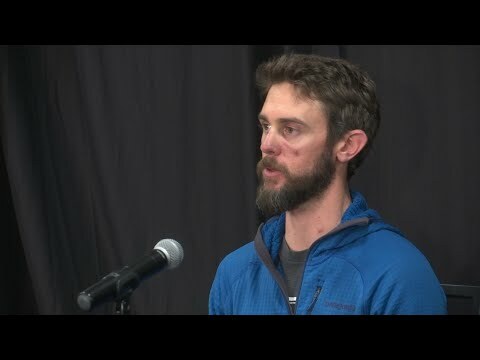 KAMAS, Utah (AP) — Utah authorities say a bow hunter suffered minor chest and leg injuries when he was attacked by a mountain lion that stalked him and his father before and after the attack. Division of Wildlife Resources spokesman Phil Douglas says the attack happened Saturday in mountains near Kamas, east of Salt Lake City. BOULDER, Colo. (AP) — Colorado wildlife officials are trying to track down mountain lions sighted in Boulder, including the one that became trapped inside a home and killed a house cat last week. HAY SPRINGS, Neb. (AP) — State wildlife officials say a female mountain lion has been killed by a landowner in northwest Nebraska who found the animal killing his chickens. The Nebraska Game and Parks Commission officials said in a release Tuesday that the cougar was killed on land north of Hay Springs. Mountain lions are protected, but state law allows the killing of a mountain lion if the animal is in the process of stalking, killing or consuming livestock.